The University of Iowa’s Mobile Museum is outfitted with new exhibits and ready to roll around the state for its second season. Casey Westlake is communications coordinator for the UI Mobile Museum, a 38-foot long RV that was custom built by Winnebago Industries in Forest City. “Our goal is to bring UI research and one-of-a-kind artifacts to people all across the state of Iowa,” Westlake says. The Mobile Museum will follow RAGBRAI again this summer and be at the Iowa State Fair. The exhibits in the RV, which are different from last year, focus on water, World War II and space. Gregory Howes, associate professor in the UI Department of Physics and Astronomy, says hundreds of school kids will be learning about the University of Iowa’s impact on space exploration dating back to the 1950s. “We hope that we can get out there and excite a lot of the next generation of scientists and engineers to get involved and keep the United States at the forefront of technology in space and discovery in science,” Howes says. 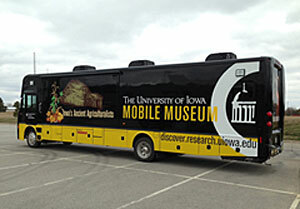 The University of Iowa Mobile Museum’s new look was unveiled last week during a visit to Lucas Elementary School in Iowa City. The RV will be parked outside the Adler Journalism Building on the UI campus today and open to the public from 12:30 to 3 p.m.